Dupont and BP will begin marketing the first generation of biobutanol in the UK in 2007. Working with British Sugar they are converting the UK's first ethanol femantation facility to produce 30,000 tonnes annually of biobutanol made from sugar beets. Biobutanol, does not adsorb water as ethanol does and thus unlike ethanol could be distributed through pipelines. It has a 30% higher energy content than ethanol which translates to greater mpg. It can be blended with either gasoline or ethanol and when added to gasoline it can be used in high concentrations, up to near 100% of the fuel without vehicle modifications. The process yields not just butanol, but acetone and ethanol as well. Production is intended to utilize a range of feedstocks such as sugar cane or sugar beet, corn, wheat, or cassava and, in the future, cellulosic feedstocks from fast growing "energy crops" such as grasses, or "agricultural byproducts" such as straw and corn stalks. Butanol as a fuel has been around a long time, but the cost to produce it was never competitive with gasoline. Using plant sugars as a feedstock, DuPont and BP believe they can favorably compete with gasoline. 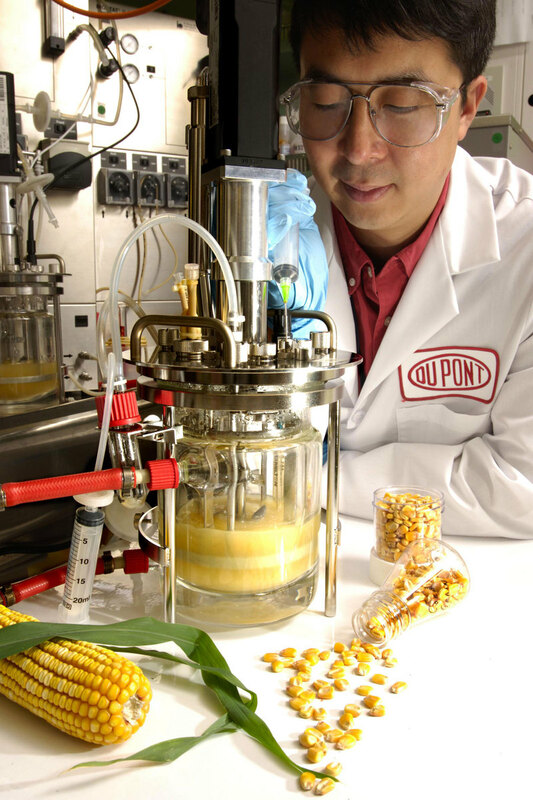 Thomas Connelly, DuPont's chief innovation officer, said the companies project that its new biofuel would be competitive, without subsidies, with oil in the range of $30 to $40 per barrel. Since production of biobutanol is similar to ethanol and uses similar feedstocks, existing ethanol capacity can be retrofitted to produce biobutanol. In a second phase, development work on a new biotechnology process using a higher conversion technology is already under way. It is planned to roll out second generation product in the US in 2010. The companies are leveraging DuPont's world-class biotechnology and bio- manufacturing capabilities with BP's fuels technology expertise and market know-how. By pooling their knowledge and expertise, the two companies aim to be the world leaders in the development, production and growth of advanced biofuels, which today account for less than 2 percent of global transportation fuels. Current projections show that biofuels could become a significant part of the transport fuel mix in the future -- possibly up to 30 percent in key markets. Added 1/20/07 - BP provides a route for butanol into the transport fuel market and aims to blend butanol with petrol at its 1200 filling stations. In addition, in an attempt to curb C02 emissions, the EU has suggested that biofuels should account for 5.75% of total fuel sales by 2010. More recently the Commission has proposed that biofuels should make up 10% of total fuel sales by 2020 which represents a huge increase in the market for biofuels. If this is all true, then we should have a biofuel with better properties than ethanol. It would seem to me that with companies like BP and DuPont involved their should be little doubt that their claims are true and that the business is projected to be very profitable. It is also a sign that biofuels have come of age. Although I wouldn't bother watching the flash animation on the process... its a little basic and doesn't give any details on the actual biofuel processing part. It just makes me wonder why ethanol is even on the table when I read things like this. We go on about Big Corn and its lobby but if the feedstock for this is as diverse as BP claims then WHERE'S THE HASSLE? The smell? Didn't stop diesel from being around for the last twenty years. Give me a break. Why is ethanol on the table? because it's been around for so long. The plants are already there. No company has a monopoly on the ethanol business, or the ability to slap royalties/legal junk/etc. on the ethanol making process. This is all crucial when ethanol is now law in so many U.S. States. And just like the fuel cell industry is going through the "dirty hydrogen" phase, this must go through its baby steps, too. The differences between Ethanol and Biobutanol are huge. The corn lobby won the first round, however, Biobutanol will and should win the remaining rounds -- heck ya can't even transport Ethanol in an existing pipeline and Biobutoanl has a 30% higher energy content -- it's unfortunate the corn lobby pulled a fast one, however, retrofitting to produce Biobutanol will help. The good thing is that BP and DuPont have the big business muscle to compete with ADM and the other multi-national ethanol conglomerates. Butanol is a superior gasoline replacement or additive, butanol is better in fuel cells, and butanol is a better diesel additive than ethanol. For sipping, I prefer 12 year old Scotch, thanks. The process yields not just butanol, but acetone and ethanol as well. At the scale of BP's demonstration plant, this is well and good, but if you intend to produce billions of liters of butanol, co-products are a drawback, because you have to find a market for all of your products. You can't profitably make more butanol if you can't make butanol without making acetone, and you've already saturated the market for acetone. One definition of hazardous waste is chemicals that you can't sell. Before biobutanol can become big, we need a way to make it selectively. Now, semi-recently, a group at Ohio State demonstrated a two-stage fermentation where one Clostridium strain selectively fermented sugars to butyric acid, and then a second strain converted this to butanol. This, or something like it, could be the "second generation" technology they plan to deploy in the US in 2010, and if so, it would be news indeed. shows that Environmental Energy Inc. http://www.butanol.com/index.html is also making good progress on this. Runs in unmodified gasoline or diesel engines. I don't see how some of you can bash the "Ethanol Cartel" and show preference for Du Pont and BP over the likes of ADM. I don't subscribe to the notion that corporations and especially oil companies are evil, but I'm no fanboy for any particular company either. Why on Earth would people root for, say, BP over the likes of, say, ADM? I definitely favor Butanol over Ethanol, but I don't want to see ADM collapse and an already large corporation swallow it up and come closer to a monopoly either. I just perceive that some of the comments I've seen here and in many other places kind of give ADM the short shrift and ascribe to them a lot more power and influence than they really have. CEW has it right. I've been following www.butanol.com for some time and have to wonder if the company behind that site was involved in the Du Pont/BP project, or if they are now an unfortunate competitor. They have some very interesting material on their site on how their process works, some of the testing they've done on the fuel in regular unmodified vehicles, and the regulatory hoops they've hurdled. They also have a great packet of info on the trickle down economic effects of running a bio-refinery vs. imported petro-chemicals. I need your fax number to send my particulars on my electric car research work to you. Thank you. this is so good to see. i wonder it they will push this for the future. I don't know this is the way to go, this can cause the price of corn to be raise and, as we know everything has corn syrup this days. This an interesting approach. It is common to take care of SEO from the individuality of ones' blog or web while leaving the incredible opportunity social media offers aside. This post clears up the way to better understand the way both activities interact and the steps to be taken to get the best results in your way to success. I don't think for ethanol will also used for the as fuel.. In Automotive industry made good technology for all cars.. this is really great. vehicle modifications. The process yields not just butanol, but acetone and ethanol as well.